Commercial Pilot Students must demonstrate their ability to control and manoeuvre the aircraft solely by reference to flight instruments. perform climbing, descending, and level turns at various assigned angle of bank to assigned headings. ±10° of assigned angles of bank. Smooth and co-ordinated flight. “Bug” headings before you turn—use the rotating card of the ADF or VOR display so that the heading you are flying is under the lubber line or omni-bearing indicator. Unless otherwise requested, use precise standard rate turns. 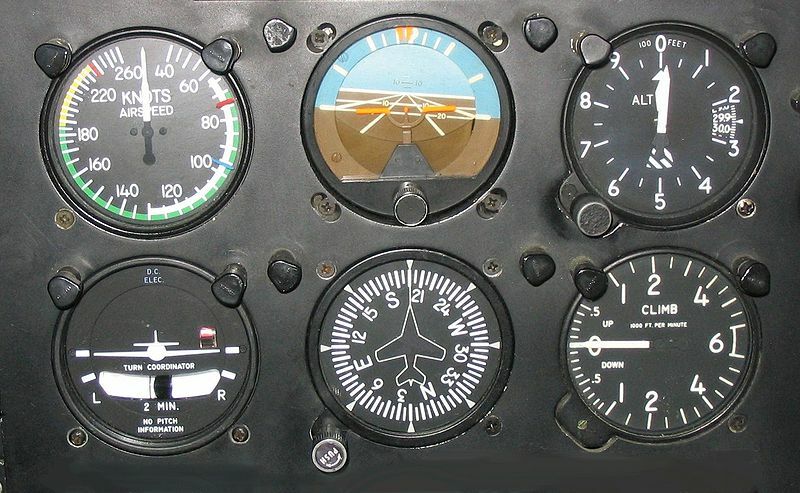 Place the attitude indicator wing bars with precision—this becomes especially important during combined movements (such as a simultaneous pitch and bank change). Always work the aircraft’s altitude back to the target altitude. 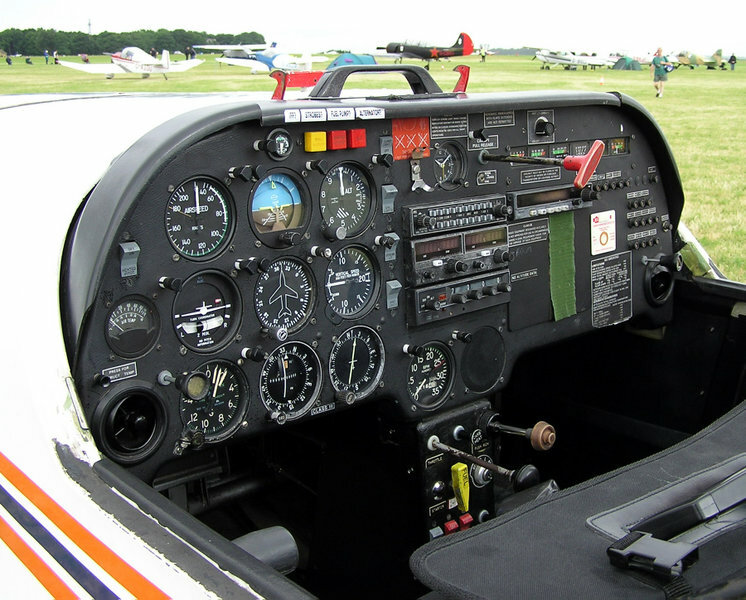 Commercial Pilot Students must demonstrate the ability to control and manoeuvre the aircraft with sole reference to the instruments, but without reference to the attitude indicator and the heading indicator. conduct a rate-one timed turn, in the shortest direction, to a heading specified by the Examiner. Note: the turn shall not be less than 90°, and not more than 180°. One heading correction will be allowed. This exercise simulates the real possibility of being in conditions of poor visibility with little or no outside visual reference, and you lack instrument reference to the attitude indicator and the heading indicator—presumably the vacuum pump driving these gyros has failed.1 The compass, of course, is useless during a turn—therefore we have to time standard-rate turns using the turn co-ordinator and a clock or watch. In both cases, begin by “bugging” the current heading of the aircraft under the ADF or VOR azimuth “lubber line”—the index marker at the top of the display (the rotating card of the ADF display is best for this as it is less encumbered—on some VOR displays the azimuth card is not entirely visible to the pilot. Using the math method, find the number of degrees required to turn (left or right) to the prescribed heading and divide this number by 3—that is 3° per second. Then begin the timed turn. Using the “visual” method, skip the math and go directly to seconds. Given the aircraft’s current heading, we know that the 90° markers on the rotating card, either left or right of the current heading is equivalent to 30 seconds, the 45° markers (left or right) are equivalent to 15 seconds, and that the 180° marker is 1 minute. We also know that each 10° marker is approximately equivalent to 3 seconds (although this will leave us short 1 degree). If our current heading is 360° and we are asked to turn to a heading of 055°, we can now look at the rotating card and determine that a turn to 045° will require 15 seconds, and that an additional 10° to 055° will require approximately 3 seconds—the total time for this turn is 18 seconds. As another example, we are asked to turn from the heading of 360° to that of 230°. Here, we can look at the card and establish that this will require 30 seconds to turn left to heading of 270° (a 90° turn), and that we will have to turn an additional 40°. We can add another 3 seconds for each additional 10° we have to turn—i.e., 4 ´ 3 = 12 seconds—giving us a total turn of 42 seconds. We can also shortcut here by knowing that the 225° marker on the rating card equals a 45 second turn to the left—so subtract one second from this and we will be generally in the ball park. The thing to note here is that we do not have to be too precise in our initial reckoning of time—in all cases, after we complete our initial turn we will have to fine-tune the aircraft heading to match the prescribed heading using very short and brief time turns—2, 3, 5, 10 second turns, etc. It is important to have a good technique for starting and stopping your timed turns—start the timer as you start the roll into the standard rate turn, finish the time and then roll your wings level. It is critical that you maintain the correct rate-of-turn indications on the turn co-ordinator with precision. If you place the wing bars with even the slightest imprecision, the exercise will be defeated. In between turns, you will have to be equally precise at maintaining a zero turn-rate—while you are reckoning the time required for a turn, even the slightest deviation from the current heading will muck-up the exercise and require that you redo your work. Commercial Pilot Students must demonstrate the ability to promptly recover, using limited flight instruments, from an unusual attitude. Using limited panel, students must promptly recover with a minimum loss of altitude from one unusual attitude—either nose high or nose low. See Discussions regarding unusual attitudes (for Private Pilot Students) on P. 143. For Commercial Pilot Students, you will be tested on the unusual attitudes using limited panel—i.e., the vacuum system has failed and you have lost your pneumatic gyros—attitude and heading indicators. Corrective pitch, of course, is reckoned from the airspeed indicator, while corrective roll is based on turn co-ordinator indications. Worthy of note, when recovering from a spiral dive, the temporary “freezing” of the airspeed indicator needle indicates approximately that the nose has passed through the cruise attitude during the rectifying pitching-up recovery movement. As well, but somewhat obviously, the normal climb pitch after the recovery has been completed is reckoned based on the airspeed indicator (i.e., establishing the normal climb speed). 1 It is important to emphasize that this is not uncommon for the vacuum pump that drives the attitude indicator and heading indicator gyros to fail, and this could occur during the day in association with conditions of poor visibility, or at night—e.g., over an unpopulated area lacking natural or unnatural lighting. Commercial passenger flying at night is only permitted in multi-engine aircraft equipped with two separate gyro vacuums.